Over 200,000 citations or references to these websites exist in Google Books, and this is basically what you’ll get when you follow them. There’s no excuse for this anymore. “Sorry, the page you were looking for is no longer available.” In everyday web browsing, a frustration. In recreating or retracing the steps of a scholarly paper, it’s a potential nightmare. Luckily, three tools exist that users should be using to properly cite, store, and retrieve web information – before it’s too late and the material is gone! 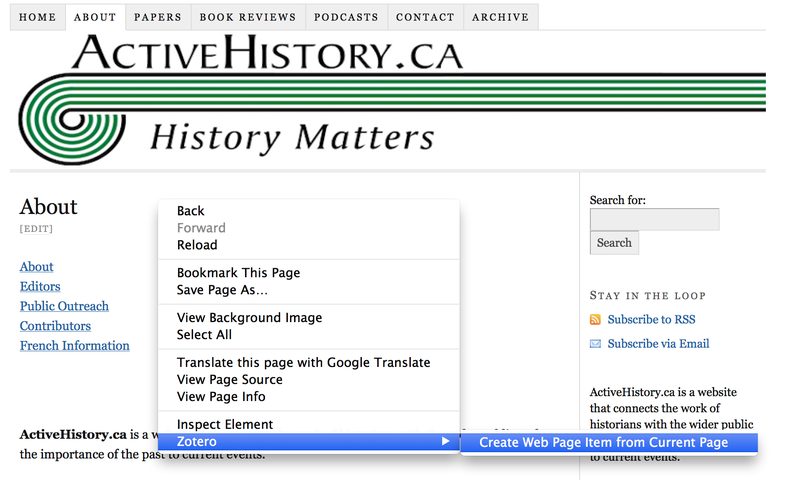 Historians, writers, and users of the Web cite and draw on web-based material every day. Journal articles are replete with cited (and almost certainly uncited) digital material: websites, blogs, online newspapers, all pointing towards URLs. Many of these links will die. I don’t write this to be morbid, but to point out a fact. For example, if we search “http://geocities.com/” in Google Books we receive 247,000 results. Most of those are references to sites hosted on GeoCities that are now dead. 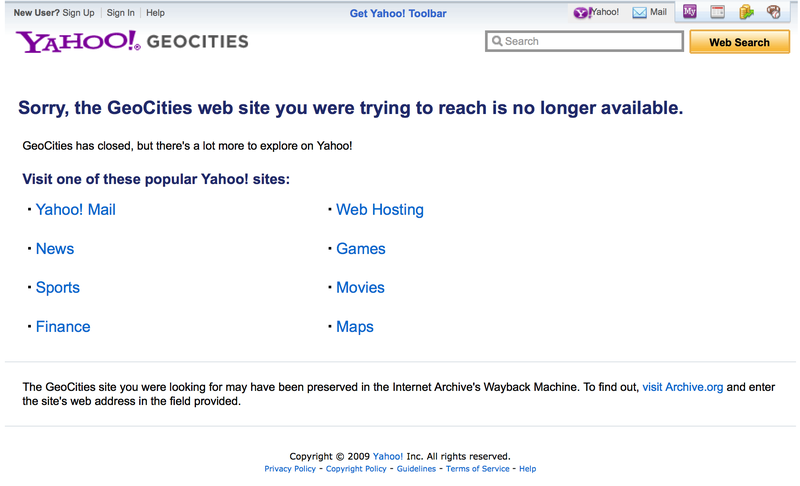 If you follow those links, you’ll get the error that the “GeoCities web site you were trying to reach is no longer available. What can we do? We can use three tools. Memento to retrieve archived web pages from multiple sources, WebCite to properly cite and store archived material, and Zotero to create your own personal database of archived snapshots. Let’s look at them all in turn. I’ll keep this one as short as possible. Installing Zotero is quite easy: you can literally visit Zotero.org, click the big red ‘download now’ button, and either run it through a Firefox browser or as a standalone program. If you already operate in the Zotero environment, chances are that you’re already adding books, journals, etc. If not, it’s genuinely worth considering: check out the Quick Start guide that they provide. Steps to save a snapshot of the current page in Zotero. For websites, I now get in the habit of making sure to save it if I think I might cite it in a paper that I’m working on. I work with a lot of websites, so this is usually the low-hanging fruit approach. Obviously, if there’s an icon in the toolbar (like a ‘book’ icon when you’re browsing an Amazon.ca page or a document icon when you’re on a blog post), you should click that if it has information. That means there’s a ‘translator’ to help you get the right information into Zotero. But if they don’t exist, and you’re citing a page, selecting that “Create Web Page Item from Current Page” selection is a good thing. You can then find it in the Zotero pane, double-click on the ‘snapshot’ icon as seen above, and you’ll be brought to a locally archived version of that page. That means that even if changes happen, you’ve got a version saved that you cited. It’s quicker than ‘saving as’ whenever you want to cite a page. The problem with this Zotero snapshot is that while it’s handy for you to have it, nobody else has it. If you’ve found a website that you want to cite in a paper, you will want to make it a bit more durable. Luckily, such a solution exists: WebCite! Let me quote from their page here. Authors increasingly cite webpages and other digital objects on the Internet, which can “disappear” overnight. In one study published in the journal Science, 13% of Internet references in scholarly articles were inactive after only 27 months. Another problem is that cited webpages may change, so that readers see something different than what the citing author saw. The problem of unstable webcitations and the lack of routine digital preservation of cited digital objects has been referred to as an issue “calling for an immediate response” by publishers and authors. An increasing number of editors and publishers ask that authors, when they cite a webpage, make a local copy of the cited webpage/webmaterial, and archive the cited URL in a system like WebCite®, to enable readers permanent access to the cited material. It’s easy to use. You can fill out a form containing all of the information about the cite that you want to archive, available here, or you can create a special bookmarklet that you can click on whenever you want to cite the page. It’s added to a queue, and usually within a minute or two you’ll get an e-mail with the actual citation that you should use. Plunkett, John. “Sorrell accuses Murdoch of panic buying”, The Guardian, October 27, 2005, URL: http://media.guardian.co.uk/site/story/0,14173,1601858,00.html, Archived at http://www.webcitation.org/5Kt3PxfFl on December 4th, 2006. Merle, Massie. “Eye of the Storm: History, Past and Future at the University of Saskatchewan”, ActiveHistory.ca, 12 June, 2014, URL: http://activehistory.ca/2014/06/eye-of-the-storm-history-past-and-future-at-the-university-of-saskatchewan/, Archived at http://www.webcitation.org/6Qllcr92p on July 2nd, 2006. If you’re a journal editor, you can join WebCite (for free) and enhance your style guide with references to this more sustainable procedure. WebCite is a member of the International Internet Preservation Consortium, and it’s worth considering adopting them! That being said, they could use funding so if you think this is a service worth keeping, consider donating! You can also consider adding pages to the Internet Archive’s Wayback Machine, by filling in the URL in the Save Page now pane of the main Wayback Machine splash page. 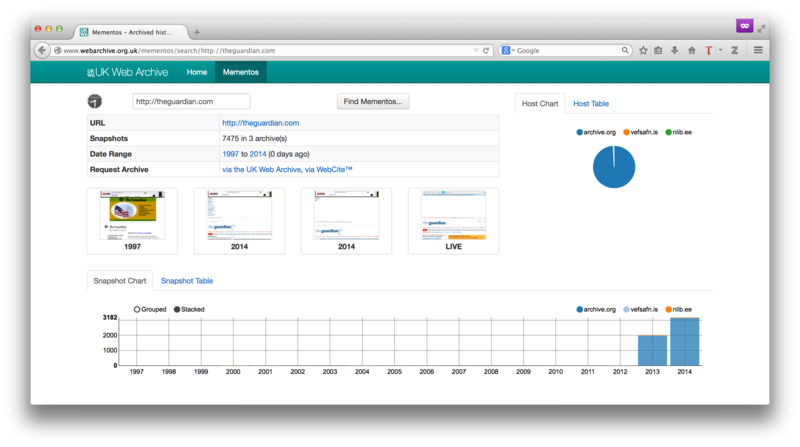 I’ve written about the Internet Archive’s Wayback Machine before. But they’re not alone in the business of creating web archives: many countries and institutions have their own accessible web archives. Memento is a way to bring them all together into one portal. Funded by the Library of Congress and the product of a , this is a good one-stop shop to find old archived versions. So if you cited something before, forgot to save it, realize now that it’s changed or gone, this is a good way to go back in time to see if it might be archived somewhere. To use Memento, you have a few options listed here. 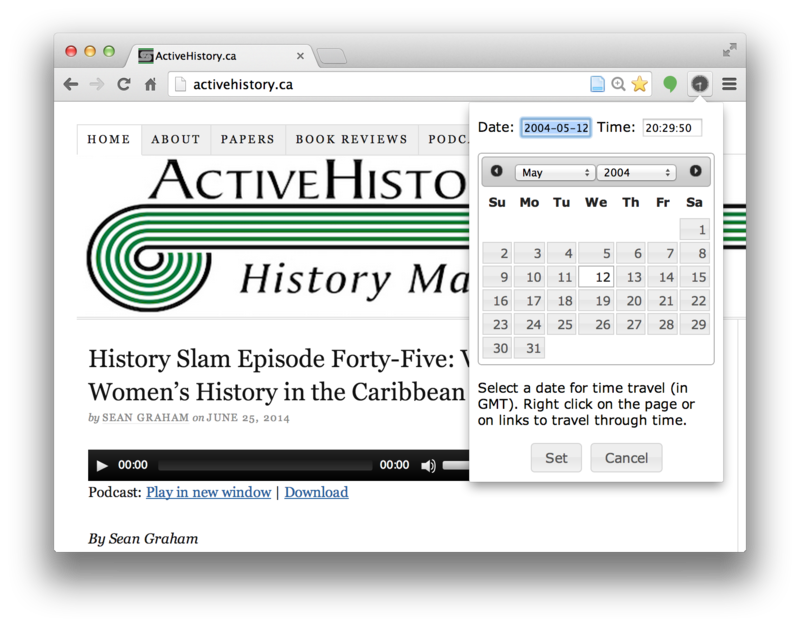 On Chrome, you can get a little icon that runs in your toolbar, that quickly lets you go back in time. See it in action below. For other browsers, you can set up a bookmarklet that’s similar to what we did above with WebCite, available here. These are just a few tools that down the road can save a harried independent scholar, undergraduate, graduate, faculty.. well, anybody, really! There really is no excuse to not be responsible with the web material that you’re citing. These tools make it easy to save, cite, and find archived web material. Good luck out there, and research the web safely. Ian Milligan is an assistant professor of Canadian and digital history at the University of Waterloo. While not digital, he feels like noting that his first book Rebel Youth: 1960s Labour Unrest, Young Workers, and New Leftists in English Canada has just been released by the UBC Press.